Happy Monday, friends! Today it is my pleasure to introduce you to Nike Chillemi and introduce her debut novel, Burning Hearts which I’ve had the privilege to read. I met Nike through the edgy christian fiction lovers site and was honored to be a judge in the romance category for the Grace Awards she put together. Nike has been called a crime fictionista due to her passion for crime fiction. She is a member of American Christian Fiction Writers (ACFW) and the Edgy Christian Fiction Lovers (Ning). She was an Inspy Awards 2010 judge in the Suspense/Thriller/Mystery category and a judge in the 2011 Carol Awards in the suspense, mystery, and romantic suspense categories. She is the founding board member of the Grace Awards, a reader’s choice awards for excellence in Christian fiction. 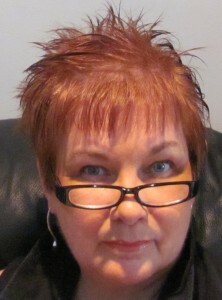 She writes monthly book reviews for The Christian Pulse online magazine. 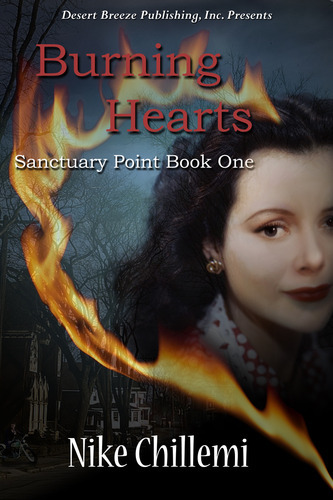 Burning Hearts is the first book in the crime wave that is sweeping the south shore of Long Island in The Sanctuary Point series. Everyone meet Nike. Nike, meet everyone! I love to know how writers started up. What inspired you to put your fingers to the keyboard? I did the usual teen thing, writing bad poetry filled with angst. And sometimes I would trap my friends or parents and make them listen while a read it. I’ve always been comfortable expressing myself in writing. However, about five years ago I started to feel an inner prompting to write fiction…novels to be exact. And I just followed that inner niggling and here I am. I had fun reading Burning Hearts. Tell us where the idea for Burning Hearts came from? I wish I had something exotic to say about how I came up with the storyline. The truth is I keep a file of possible plotlines. I’ve got about fifty stories in that file right now. I add to a storyline as something comes to me. One of them will grab hold of me. The characters start to take over and demand their story be told. That’s what happened with Burning Hearts. I could see Erica and Lorne vividly and I had to write their story. Erica is a bit like me. She wants to be a dress designer and I graduated from the Fashion Institute of Technology and worked in the bridal industry. She’s independent and stubborn and it gets her into trouble. I’m independent and stubborn but it never got me into any trouble at all. Yeah, right. Something I didn’t realize until the book was in edits is that Erica’s mother is very similar to my Czechoslovak grandmother. Mrs B excels in the kitchen and has a great sense of humor. So did my grandmother. Mrs. B teases her children and is teased by them. I recall my grandmother swatting my dad with a kitchen towel. He’d laugh and hug her. Those sound like great memories. My grandma swatted me too, but with a fly-swatter and not out of playfulness. 🙂 I had it coming. Something I loved was the lingo from that day. Their dialogue transported me to a whole new world. Golly jee, I loved it! How much research did you do for this book and what resources helped you the most? I did a lot of research, definitely on slang of the period. They also had a certain rhythm and cadence to their speech. I listened to classic movies of the period to internalize that. I combed websites devoted to 1940s fashion and hairstyles, checked and double-checked products such as Mrs. Brogna’s Bendix washer. I also read up on the political situation in Europe at the end of WWII. Well, you did a great job. I loved reading about Erica wearing pants when most women didn’t, or how she copied the patterns from Sears & Roebuck. So fun! What challenged you most when writing Burning Hearts? The greatest challenge was making Erica strong without her becoming abrasive. I saw her as feisty and wanting to follow her own convictions, but I had to craft her so she would retain a sweetness and naivety. That was like walking a tightrope. 1) I’m a lot more ditzy than people think I am. 2) I was an independent animal rescuer for a good number of years. I’ve rescued about 40 dogs and cats and found them homes. 3) My idea spot on earth would be in the tropic under a cabana with a good book as the surf comes in and goes out. Oooh, #3 is on my list too! Nike, thanks so much for letting me read your book and for stopping by. Take a peek into Burning Hearts! “Erica Brogna’s parents doted on her and taught her to think for herself. So many young men she grew up with fell in the war, shaking her childhood faith. In rides a handsome stranger, at the hour of her desperate need when her best friend and mentor is trapped in a burning house. This stranger rushes into the inferno and carries Erica’s friend’s lifeless body out.